Our grandson is turning two this month and he doesn't know how to read yet, so I've made this card with TWO candles on it. Hopefully he gets a little help "reading" or counting those TWO candles on his special day. That adorable little birthday hat is from the retired Party Animal Embellishment package, which never got used in my craft room until now! The Pacific Point Stitched Edge Ribbon is *brand new*, available starting today, so I hope you are excited to see how new products blend right in with the "old." Thanks for looking today! 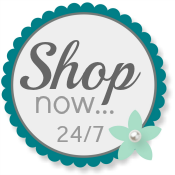 I hope you will choose my Online Store for your Stampin' Up! purchases. I'd love to be your demonstrator!